I've been pretty focused on the new Tron Legacy line for the past several days, so I wanted to step back and focus on the true Preserve passion, the vintage! In particular, I have the honor of adding something else new to the collecting dialog with another unearthed Army Gear combat medal. 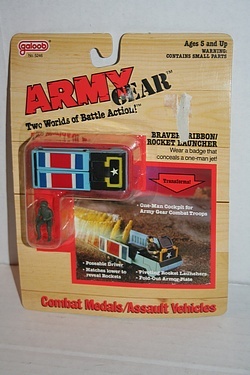 Here we have the Bravery Ribbon / Rocket Launcher, one out of eight hard to find wearable military accessories that let kids (well, not many kids apparently) take their toys on the go in 1988! It's a shame that the small articulated army figures didn't end up being painted to match the prototype that is featured in the packaging photo. As it is they are very much from the green army men school - not a bad thing - but that sample image is definitely a step up. The style of these ribbons I find to be bold and exciting, and will continuing scouring the lands to complete this collection! Charlie, they actually did release painted versions of the figures both in good guy green and bad guy gray colors. Some of the bad guys were even bald with little eye patches painted on! As far as I know, these were only available in carded sets with nothing but figures (an easy way to expand ranks). I have not found any playsets or badges with painted figures yet. Oops - thanks Ben, good point! I was very remiss in not bringing up that expansion set, especially since I even managed to add it to the Preserve not long ago! I suppose that is a sad side-effect of often dealing only in still-carded items...I get caught up in the presentation of a single set at a time, instead of seeing the whole line at once for what it is overall! 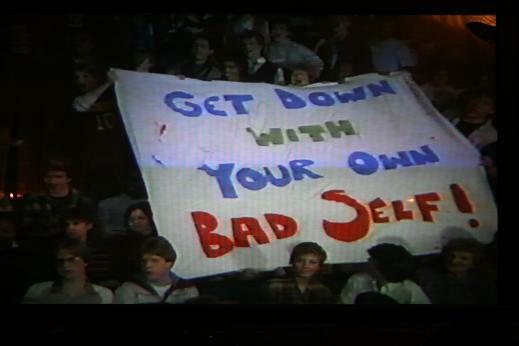 Thanks for the reminder - and you've just gotta love those eye patches!